The powerful strike of truck drivers, which has endured steadfastly in more than 300 cities in 31 provinces in Iran for its third week, has shaken the foundation of the mullahs’ regime, affecting other economic fields; paralyzing industries, the road transport and the distribution of imported goods. The people of Iran have no hope in any of the two fractions of the regime; expressing it on daily basis in protests, strikes and uprisings. They demand regime change, and the mullahs’ regime is both hopeless and incapable in confronting that. -If money is not in #Iran, then why is Hezbollah helped by Iran (but we are not)?! The uprising started with guild and economic demands which swiftly gave place to political ones. The regime’s criminal prosecutor, Mohammad Jafar Montazeri, threatened strikers on September 29, to “severe punishments and executions,” and the henchman of the regime’s judiciary, Sadegh Larijani, said on October 1, that those who are abusing the demands of truckers to undermine road safety would be severely punished. 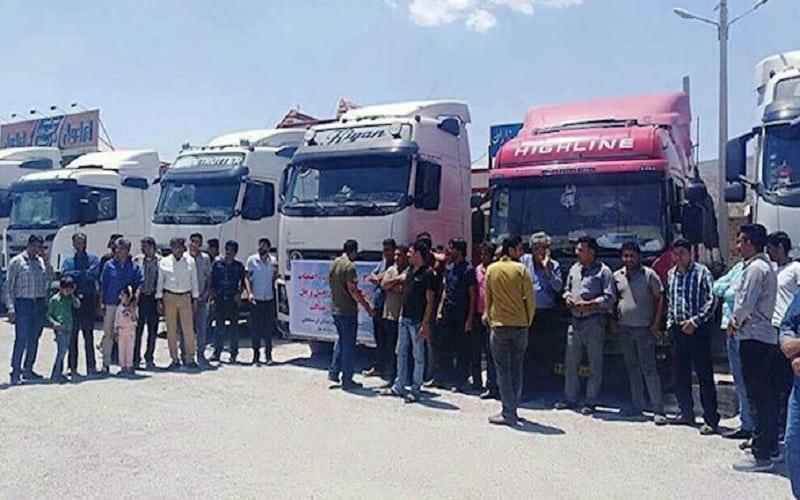 (ITF), headquartered in London including more than 677 syndicates in 149 countries, having 16.5 million members, issued a declaration of solidarity with truck strikers in 290 cities in Iran on October 2 and condemned the arrests made. “The International Transport Workers’ Federation (ITF) expresses its concern about the Iranian government’s reaction to the latest industrial action by truck drivers”. The Union of Truckers and Motor Roads (Teamster), a 1.4 million member union in the United States and Canada, issued a press statement on behalf of Teamster’s president in support of truckers of Iran on Oct. 3, which was supported by State Department on Tweeter. It is obvious that due to their reactionary nature, the anti-Iranian ruling clerics, who are under siege by the people of Iran and their organized resistance, neither want nor can solve the least difficulties that have plunged the majority of Iranians below the poverty line. For that, they have no option other than responding with arrests and more oppression in socio-political atmosphere of the society. But, this will in turn lead to promotion and continuation of the uprisings and eventually to their overthrow. Maryam Rajavi hailed the noble striking drivers and called on the general public, especially the youth, to support and express solidarity with them. She described arrests and repressive measures against drivers as indicative of the vulnerability of the mullahs regime to the united strike of drivers and truckers, adding that the ruling clerics are the greatest thieves in Iran‘s history who neither want nor can answer legitimate demands of striking drivers. Ms. Rajavi called on all human rights and labor rights defenders, and labor unions to support the strikers and take immediate action to release the arrested. She said that a regime that threatens to execute its working people because of a strike must be rejected from the international community.